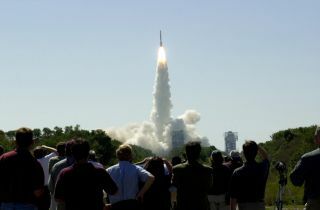 At 11:02 a.m. EDT on April 7, 2001, crowds watch a Boeing Delta II rocket lift off from Cape Canaveral Air Force Station, Florida, carrying NASA's 2001 Mars Odyssey spacecraft into space on its seven-month journey to Mars. A long-lived NASA Mars spacecraft began its record-setting Red Planet mission 15 years ago today. On April 7, 2001, the Mars Odyssey orbiter blasted off from Florida's Cape Canaveral Air Force Station, kicking off a mission designed to hunt for water ice and study the Red Planet's geology and radiation environment. In December 2010, Odyssey became the longest-serving Mars spacecraft in history, and it's still going strong today. Odyssey's long run of success has helped revitalize NASA's Mars exploration program, which had fallen on tough times just before the orbiter blasted off. For example, the space agency's Mars Climate Orbiter, which launched in December 1998, zoomed too close to the Red Planet and burned up in its atmosphere. The Mars Polar Lander and twin Deep Space 2 penetrators, which blasted off together in January 1999, failed in their missions as well. Things have gone smoothly since Odyssey, however: All of the NASA Mars missions that blasted off after that spacecraft — the Spirit and Opportunity rovers, the Mars Reconnaissance Orbiter (MRO), the Phoenix lander, the Curiosity rover and the MAVEN (Mars Atmosphere and Volatile Evolution) orbiter —have been successful. Odyssey's full name is 2001 Mars Odyssey, in honor of visionary sci-fi author Arthur C. Clarke, who is perhaps most famous for the 1968 novel "2001: A Space Odyssey." The orbiter has accomplished a great deal in its 15 years of service, NASA officials said. "One suite of instruments found evidence for water ice close to the surface in large areas of Mars," they wrote in the same statement. "Another investigation measured the natural radiation environment on the way from Earth to Mars and in orbit around Mars, gaining information vital for design of human missions in what has become NASA's Journey to Mars." The orbiter's long tenure at Mars has also allowed researchers to investigate seasonal phenomena such as dust storms, which can differ greatly from year to year, NASA officials added. In addition to its science work, Odyssey has served as a relay link between NASA's Mars surface craft and mission control back on Earth. More than 90 percent of all of the data received from Spirit and Opportunity have been routed through Odyssey, NASA officials said. The orbiter, along with MRO, helps beam home data from Curiosity as well.